Of all of the plays I’ve studied, Oklahoma’s bootleg double post had the most outrageous statistics I’ve come across. 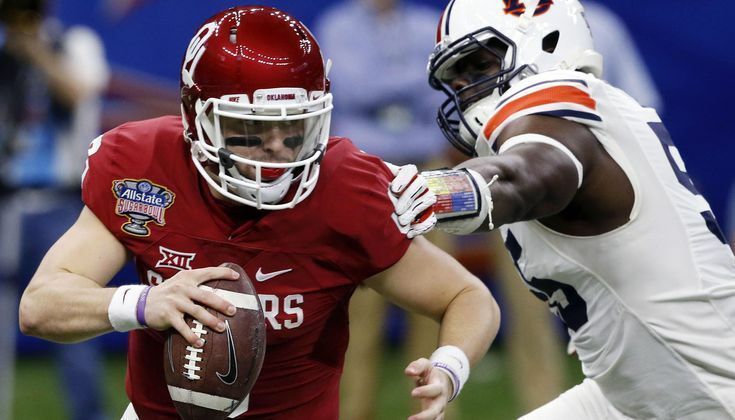 When running it in 2015-16, the Sooners went 10-for-15 for 463 yards, five touchdowns and no interceptions. Yeah, you read that correctly, they averaged over 30 yards per on this play. 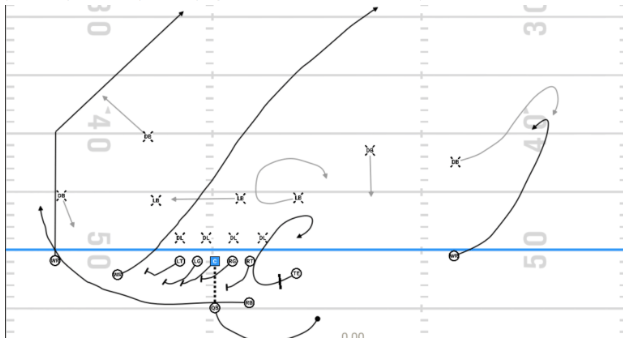 The play action, and anytime the quarterback boots out, is a run threat that occupies underneath coverage and creates space for the H on the crossing route. Since the X receiver&apos;s route occupies the corner, if the free safety doesn’t play the crosser, the H’s route is open with nobody between them and the end zone. In the following example, the free safety falls for the play fake, and leaves the crosser open. Note how the offensive line sells outside zone. 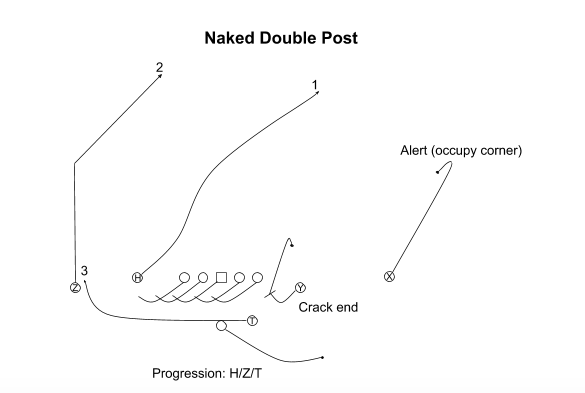 Normally, when playing single-high, the free safety runs with the crosser, which leaves the backside post route a whole lot of space to beat the corner and get open. This was especially effective because Oklahoma had quarterback Baker Mayfield throwing these post routes to NFL-caliber receivers like Dede Westbrook. Against two-high coverages, the Sooners only called this play when they expected quarters and thought the front side safety would bite on play action. Since quarters safeties have run fits, and their run key is the No. 2 receiver (who&apos;s blocking run), the offense could usually get the look they wanted. If the safety comes down for run support, the play should work like it does against single high, where the crosser is open unless the backside safety takes it away, in which case, there’s tons of space for the post to get open. 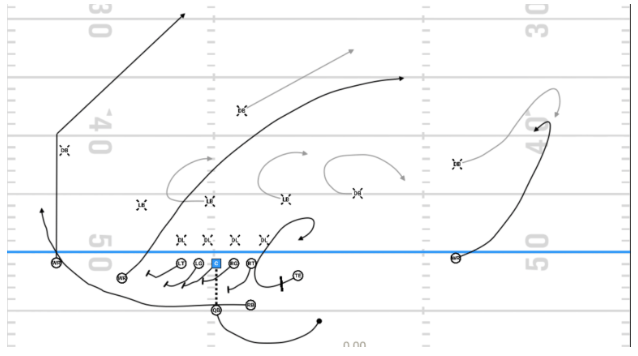 Below is an example where the frontside quarters safety bites on play action, and since the backside safety doesn’t play the cross, it&apos;s wide open. 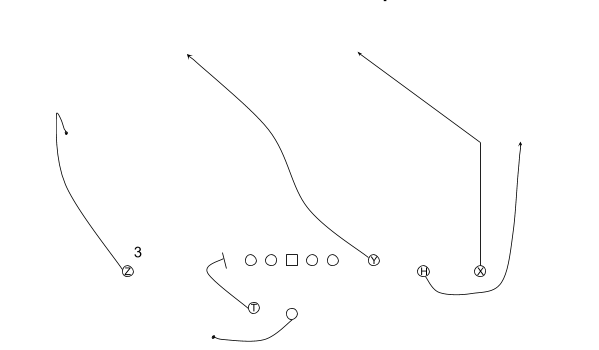 In this example, the defense is in Cover 6 (quarters to the frontside, Cover 2 to the backside). This is a great coverage to run on this play against because the frontside quarters safety has run responsibility, and the backside safety can’t help on the crosser because he has deep-half responsibilities, especially since they&apos;re playing cut technique with the corner. Oftentimes, the backside safety covers the crossing route, which again opens up space for the backside post. One thing to note, they always boot to the wide side of the field, which gives more space for the boot, but more importantly, the crosser has less distance to run to get across the formation. 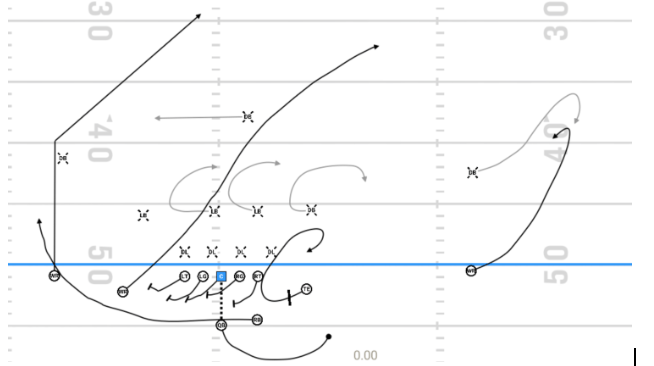 While not preferable, there are times where the frontside safety doesn’t bite on play action and can play the crosser, which eliminates the bind put on the backside safety. The few times this happened, Oklahoma still did okay on the play. In the following example, the frontside safety doesn’t bite, so there are two safeties deep to cover both the post routes. Because of this, Mayfield goes to his third progression, and throws to the running back on the wheel route for a key third-and-27 conversion. 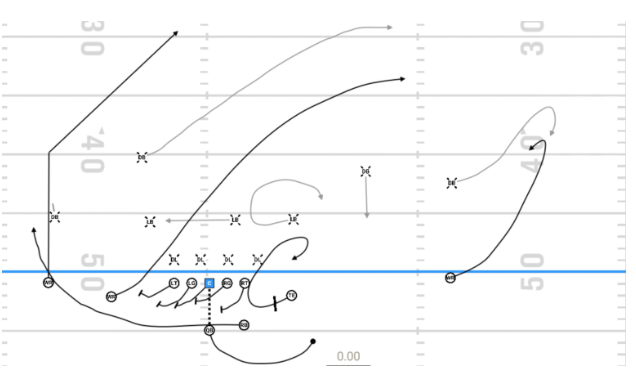 The Sooners also ran the same concept but instead of running a boot from 2x2, they ran it from 3x1 off dash action, where the QB pumps to a bubble screen one way and rolls the other. The progression here is the same for the quarterback, working double post to wheel. Contact Noah Riley at noahbriley@lclark.edu or find him on Twitter @Noahriley21. Check out more of his work at rileykolstefootball.com.